The CX1030 basic CPU module offers Pentium® M power on the DIN rail. The CX1030 has a 1.8 GHz Intel® Pentium® M CPU. The CPU is cooled via the cooling module and an easily exchangeable fan cartridge located on the underside of the housing. The fan speed can be read via software and can therefore be monitored. In addition to the CPU and the chipset, the CX1030 module also contains the RAM, which is available in different sizes. The controller boots from the Compact Flash. The basic configuration of the CX1030 includes a 64 MB Compact Flash card and two Ethernet RJ 45 interfaces. 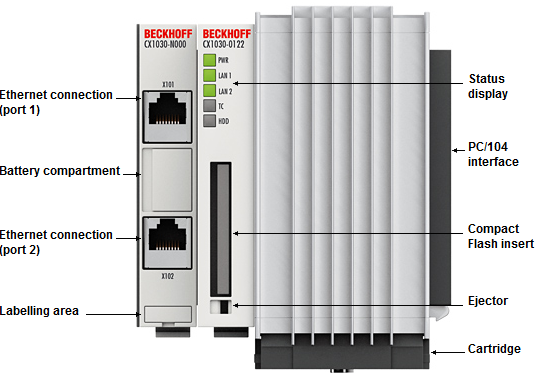 These are connected to an internal switch and offer a simple option for creating a line topology without the need for additional Ethernet Switches. All other CX family components can be connected via the PC/104 interface that is available on both sides. The passive cooling module is included in the scope of supply. The operating system can be Windows CE or Windows Embedded Standard. 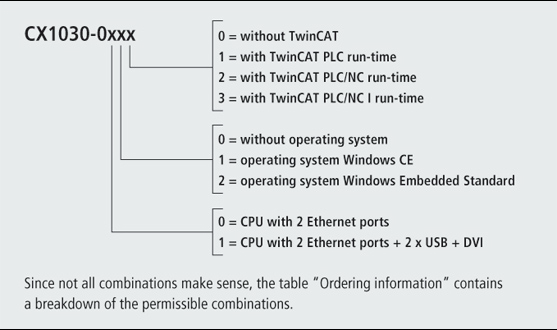 The TwinCAT automation software transforms a CX1030 system into a powerful PLC and Motion Control system that can be used with or without visualisation. In contrast to the CX1010, the CX1030 can also be used for interpolating axis movements with TwinCAT NC I. Further system interfaces or fieldbus connections can be added to the basic CPU module. The CPU module requires a CX1100-001x type power supply module. All CX1500 fieldbus modules and all CX1100-001x power supply units from the CX series can be used in combination with the CX1030.